03:37 <Lachie> why would you feel like you're banned? 03:38 <Lachie> appears to be. 03:41 <CIA-3> OpenTTD: rubidium * r13752 /trunk/src/ (4 files): -Fix [FS#2130]: correctly restore conditional orders when they are put 'into' backup. 05:46 <Yorick> dih: was that on clean trunk? 05:47 <dih> what else should it be? 05:47 <Yorick> patched server? patched client? 05:47 <dih> Yorick, i know how it can happen! 05:48 <Yorick> what's bothering you? 05:53 <Osai> hi. is anyone familiar with road stops and the queueing behavior of busses? 05:58 <frosch123> Osai: It only works properly with standard road stops, i.e. not drive-through. 06:21 <Celestar> michi_cc: you happen to be around? 06:23 <dih> you wanna watch me? 06:25 <CelestarT42p> frosch123: it uses the "pathed" distance. 06:29 <CelestarT42p> dih: they are? 06:30 <CelestarT42p> frosch123: they are or they need to be? 06:32 <Ammler> they should recalculate it right before entering the new station area. 06:36 <CelestarT42p> hm .. is the ICE-TD tilting? 06:37 <CelestarT42p> yes Ammler ? 06:37 <Ammler> aren't there "half" ICEs? 06:38 <Ammler> indeed, they are. 06:44 <Mark> hm, does anyone know the "real" speed of trains? 06:46 <AmixE90> Does the link work? 07:01 <Ammler> did that change? 07:03 <Yorick> is there any way I could skip the map download? 07:04 <Eddi|zuHause3> what exactly do you want to achieve with that? 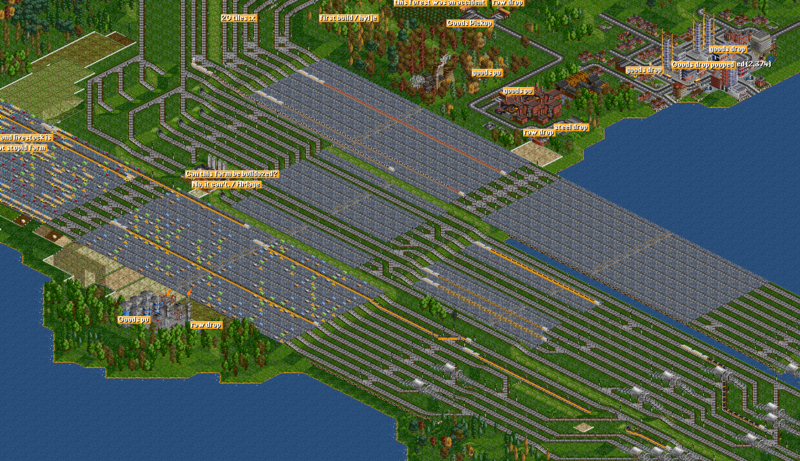 07:17 <Eddi|zuHause3> since when does openttd have "fights"? 07:19 <hylje> how efficient are RVs when it comes to simulating them? 07:34 <hylje> "Remove absurd road-elements during the road construction"
07:35 <hylje> "Road vehicle queueing (with quantum effects)"
08:21 <@peter1138> Mostly infrastructure, so can't sell to get money either. 08:59 <CIA-3> OpenTTD: rubidium * r13753 /trunk/src/order_cmd.cpp: -Cleanup (r13752): save before commit instead of the other way around is usually better. 09:30 <CIA-3> OpenTTD: rubidium * r13754 /trunk/src/openttd.cpp: -Fix (r13731): one could not join companies from the command line. 10:37 <CIA-3> OpenTTD: glx * r13756 /branches/noai/src/ (ai/ai_squirrel.cpp fileio.cpp fileio.h): [NoAI] -Fix: when an AI is found in a tar, use a fake link to the first dir. This is to ensure the dir in the tar is used when starting the AI, instead a dir outside the tar if they have the same name. 11:34 <Nite> guess this has something 2 do with the server downtime? 11:35 <Nite> does the "find server" / "server list" work for u? 11:36 <Yorick> what version are you using? 11:39 <Yorick> he saves himself 2 characters to write! 11:49 <Nite> could it be taht my ISP caches the DNS records for MUCH too long. 13:51 <DJNekkid> yet another newgrf question ... is it possible to define a constant with newgrf? 13:52 <@Rubidium> constant in what manner? 13:52 <@Rubidium> just some value that is the same throughout your newgrf? 13:54 <Ammler> do you know the Makefile from Aegir? 13:57 <DJNekkid> and what do i read that with? 13:57 <DJNekkid> any nice and easy software to use? 14:23 <Yorick> and why is it none of my business? 14:23 <Yorick> dih: it's about rortom enhancing the autopilot? 14:27 <dih> well done peter1138 !! 14:28 <@peter1138> Has anybody written passenger destinations decently yet? 14:29 <@peter1138> Has anyone fixed transfer (without unload) to not immediately load what it just depositted? 14:50 <@peter1138> Eddi|zuHause3, saveload is pretty easy, they've just done it all wrong. 14:51 <@peter1138> Hey, I've finally made some money... by stopping a train that was waiting on transfers until it was ready to full-load... heh. 14:52 <@peter1138> I could do with the loan going up by 50,000. 14:55 <Eddi|zuHause3> or do you mean the max loan? 15:00 <Ammler> yeah, sometimes, it is fun "just to read the signs"
15:02 <Ammler> Eddi|zuHause3: did you try "over" the scenario editor? 15:06 <rortom> is the savegame format documented somewhere? 15:18 <Yorick> In music, a riff is an ostinato figure: a repeated chord progression, pattern, refrain or melodic figure, often played by the rhythm section instruments, that forms the basis or accompaniment of a musical composition (though they are most often found in rock music, Latin, funk and jazz). 15:21 <CIA-3> OpenTTD: rubidium * r13759 /trunk/src/ (depot_gui.cpp gfx.cpp gfx_type.h): -Fix [FS#2147]: selecting non-full length vehicles in the depot gui would place the "mouse pointer" out of the center of the vehicle making it hard to "aim". 15:35 <Yorick> do we have a chatlog thing? 15:43 <ln> hmm, so are there refittable trams? 15:44 <ln> Eddi|zuHause: are there such trams in cstramset? 15:44 <Eddi|zuHause> ln: does it have a readme? 15:53 <planetmaker> Is there an easy way to query sourcewise the 4 adjacent tiles, given an arbitrary, known tile? 15:53 <Yexo> Adding TileIndex(0, 1), TileIndex(1, 0), TileIndex(0, -1) and TileIndex(-1,0)? 15:54 <planetmaker> Brianetta: yeah, I could add each direction seperatedly. Ok. No quicker way then? 15:54 <Brianetta> planetmaker: Not that *I* know of. 16:10 <planetmaker> Hm... another question more for curiosity than need right now: MakeRiver(tile, Random()) <--- what does the Random number add to rivers? 16:23 <Ammler> planetmaker: are you working on the livery patch? 16:25 <planetmaker> actually it's not my intention to make them lively... just to _have_ them at all. 16:35 <planetmaker> or is it general concensus that rivers without this lively aspect are useless? 16:51 <Brianetta> openttd: /home/brian/nightly/src/openttd.cpp:142: void error(const char*, ...): Assertion `0' failed. 17:22 <CIA-3> OpenTTD: peter1138 * r13760 /trunk/src/ (autoreplace_gui.cpp build_vehicle_gui.cpp): -Codechange: With multiple NewGRF engine sets, engine IDs may not be allocated in the order expected by GRF authors, so sort by 'list position' instead of engine ID for all vehicle types. 17:43 <@peter1138> Hmm, the AI has removed one of my road bits...? 18:42 <nicfer> did anyone remember the submarine 'easter egg' in (o)ttd? 18:43 <Ammler> submarine destroyed ships, didn't? 18:52 <CIA-3> OpenTTD: [NoAI] -Add: GetSetting(name) now gets the setting you set via SetSetting() in GetSettings() in info.nut. 20:00 <CIA-3> OpenTTD: truebrain * r13769 /branches/noai/src/ai/ai_info.cpp: [NoAI] -Fix: silly me, thinking SQInteger would be an int32 ..
20:07 <xyz> any NOAI developpers here?